I know you’ve probably been going nutty waiting to hear how our first time joining the Family Forward event went, right? I meant to share some of our fun times sooner – but there were seriously SO MANY pictures to go through! I also needed to think of how I wanted to break it up, because there’s absolutely no way to fit everything into one or two posts. I’m thinking 5-8 over the next few weeks? Then I can really give you the great details of The Crazy Good of Family Forward! This post is going to break down the actual Family Forward stuff – not including the days in Universal with the special VIP Tour we got Saturday, or the exclusive time at Wet ‘n Wild park. Those will come later! And just a note – some of these photos were taken by the Family Forward team – the better ones! While we’re on that note – the team that put this together is AMAZING! A big shout-out to (from left to right in this picture) Kendra, Marissa, Jyl and Melinda for all their hardwork and fun attitudes! Plus THANK YOU to their families and everyone else – I know it takes a village to put something like this together, and they were phenomenal! Plus this lovely lady Meredith, our rep from Universal Studios Orlando, was such a fabulous hostess even though she entirely lost her voice right before the event – what a trooper! We signed up for Family Forward RIGHT when registration opened (sold out super fast) but kept it a big secret from the kiddos all these months! They had no idea – until Thursday morning we woke them up way early, had them get dressed and in the van, and drove to the airport. Once we were on the plane with another family that was going, we pulled out some fun activity bags filled with goodies like Minions, Transformers and Harry Potter stuff and told them. They were THRILLED! Since we knew we’d need help with the kiddos, we invited hubby’s parents along for the trip – such a great opportunity to make fun memories with grandma and grandpa! 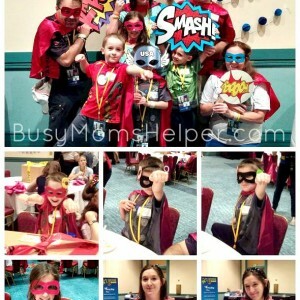 After we check into the fabulous Loews Royal Pacific Hotel (post coming soon), grabbing a tasty lunch at their poolside grill, and settling down in the room a bit, it was time for the first Family Forward activity – a Superhero party sponsored by Children’s Miracle Network Hospitals! We got capes and masks, put together care packages to help raise funds for kids fighting cancer and other diseases, and even got to color and write cards to help cheer those in the hospitals up! We had so much fun! We decided our family’s super power was working together. Some people REALLY dressed up for the superhero party – sadly our hero costumes are in storage for the whole house selling crap, so we settled for Avenger shirts! Black Widow was most excited to meet Marilyn Monroe and Betty Boop – saying ‘mom, they’re so pretty!’ Shaggy was PERFECT for his character, and along with his pal Scooby Doo took a lot of time visiting with the families. You can’t forget Gru and his crew of Minions, of course! Guess what we got to do after the dinner party?! 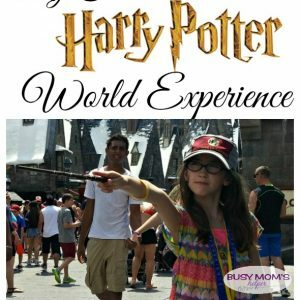 Universal Studios Orlando put us on the Hogwarts Express and sent us to Hogsmeade for an EXCLUSIVE couple of hours there where it was ONLY Family Forward attendees! Free Butterbeer, dessert bar, hardly any wait for the rides, taking our time walking through Hogwarts Castle, wand-purchases – seriously it was THE BEST! I’m going to go into a LOT more detail about the Harry Potter stuff & Hogsmeade in a later post because it deserves it’s own! 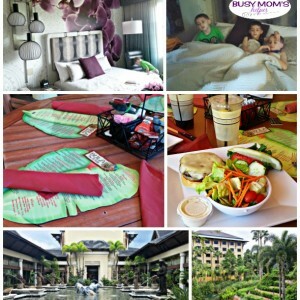 The morning brought us a yummy breakfast provided by Loews Royal Pacific Hotel, then some family-activity workshops! Black Widow was super thrilled about DohVinci! If you have no idea what that is – it’s a special playdough type thing in tubes you can stick into the crafting gun, then just squeeze and it decorates any surface! The boys needed a little assistance squeezing the gun handle, but my girl handled it like a pro! They even let us keep our masterpieces – and we managed to pack them flat and get them home without any damage – woot woot! Royal Caribbean International provided us a neat, tropical lunch and even brought along one of their characters for a photo opp – Shrek! I was lucky enough to go on a Royal Caribbean cruise for a conference in January – and after seeing all they have for kids to do, I can’t wait to take my family on a cruise with this fun company! After lunch was a really neat science experiment involving DNA sponsored by Monsanto, along with yummy colored melons for snack. The kids got necklaces at the end with a sealed vial of strawberry DNA at the end – how many kids can say they have that?! That night we got a special time at Wet ‘n Wild water park – 2 hours with everyone (it did rain a bit, but then cleared and was perfect) then 2 hours JUST OUR FAMILY FORWARD GROUP! Yup, told you we were blessed! They even provided us dinner vouchers – yum! Again, that deserves it’s own post (coming soon). Saturday morning brought us to a delicious breakfast buffet at Jimmy Buffet’s Margaritaville in CityWalk! Loved the decor, the DJ was so fun, and we got to rock out to some fun dancing and tunes. Great way to start the day! We then broke into groups of about 12 – and received a VIP Tour of Universal Studios and Universal Islands of Adventure! Seriously, this was AMAZING – straight onto the major rides with basically no wait, insider tips and information, backlot sites and so much more. LOVED IT! The 4 hours went by so fast, and we had an absolute blast! I’ll share a bit more of that in later post, too! That night we got to enjoy The Blue Man Group! I’ve never seen them before and wasn’t sure if the kids would like it – but as soon as the show started they were on the edge of their seats (Hulk woke up from his little cat nap), danced to the music, laughed along and absolutely loved it! The lovely Melinda from the Family Forward Team even got to go up and be part of the act! We had a free day Sunday until a ridiculously delicious dinner in CityWalk at either the CowFish or VIVO, an Italian place. We picked Cowfish (sushi – like hubby could resist!) – more to come on that in a later post, though! Seriously, this entire event was unforgettable and I can’t wait to do it again! Thank you SO MUCH to Family Forward and Universal Studios Orlando!